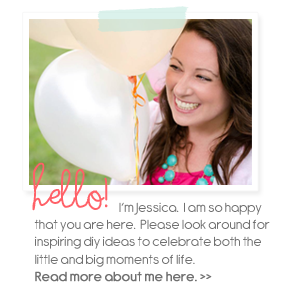 Two Shades of Pink: Apple Theme Kids Party! I sigh at the bliss of it all. I am so in my element and excited. But I just found out this week and the first party is TOMORROW! Every year, the Pre-K class celebrates everyone's birthday with one party. I was told to do a cake or cupcakes, decorate any way I want, and get plates and napkins. I rubbed my hands together in anticipation for 2 reasons. 1. I have had no time to craft just for fun. Now I can and it would be for an actual purpose. 2. I liked the challenge of getting creative on a budget and having only days to accomplish it. 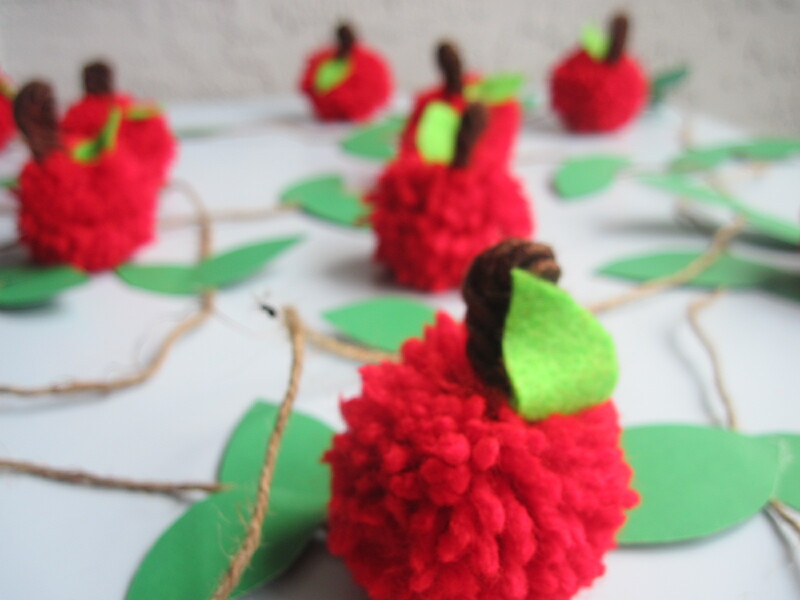 So I came up with an apple theme since it is the kid's first year of school, it's Fall, and I happened to have apple-y stuff on hand from an event I did a few years ago. So I got started. Now I don't have a lot to show you but I thought I would share with you what I have done and throw in a little tutorial too. 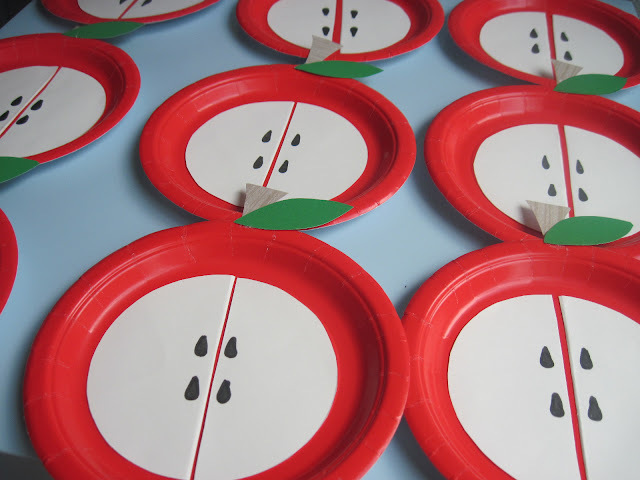 First I did these cute apple plates. 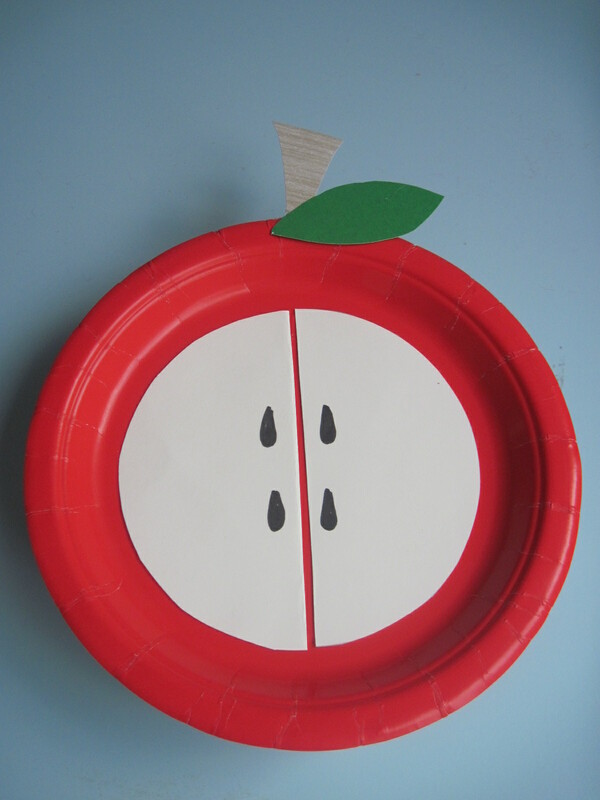 I bought small red plates, cut out circles of white card stock, folded the circles in half and cut them. I created a template for the leaves and stems and traced them out of card stock I had on hand. The apple seeds are done with a black sharpie. I liked this idea because it makes the plates part of the decoration. Another idea to do this that saves time is to buy the larger size plate in red, a smaller size plate in the white and cut the smaller plate in half or use it as is. 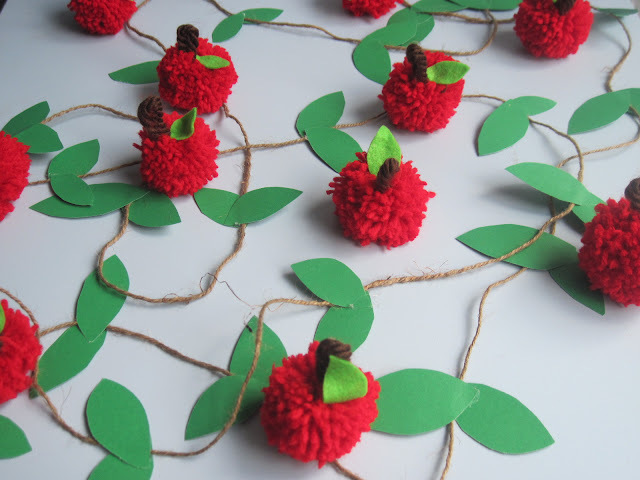 I HEART these Fuzzy and Sweet Pom Pom Apples! I had so much fun making them and they all took me about 30 minutes from start to finish. Want to do your own? GREAT! 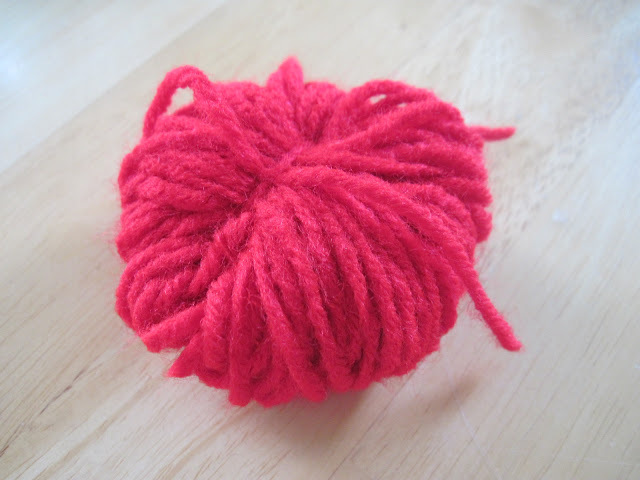 First get a big ole cheap skein of yarn. 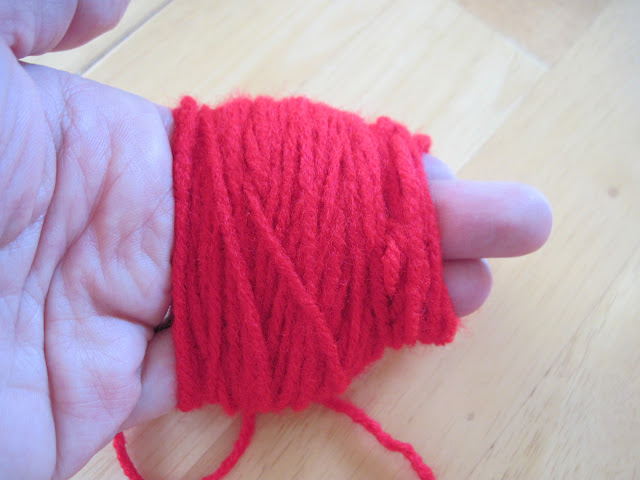 Then wrap it around your hand (snugly but not too tight). You want to be able to slide it off your hand and also receive adequate blood supply to your extremities. I am a poor example of this above as it seems I was attempting to choke my hand to death. I actually counted 80 times around to make sure they were all the same size. Slide it off and cut. 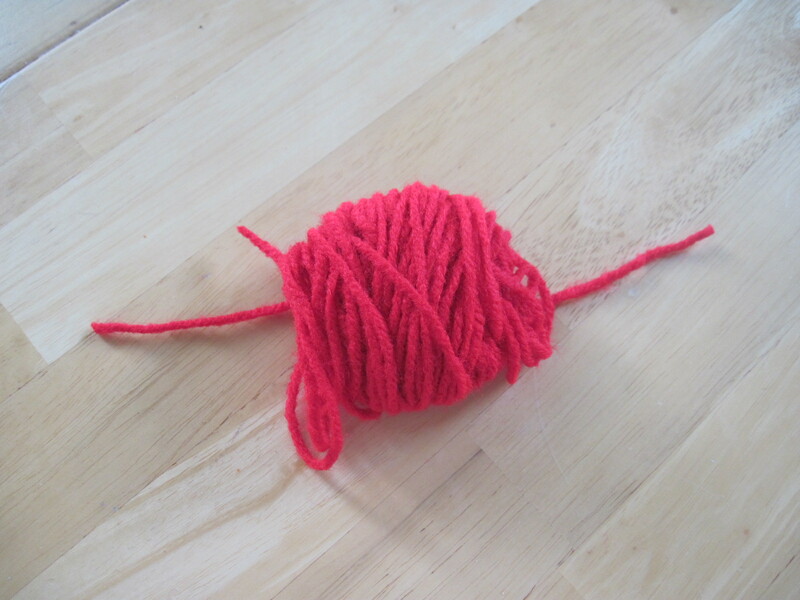 Then cut another length of yarn. Place the wrapped yarn with open ends along the length of the yarn. Tie the string in a tight knot. 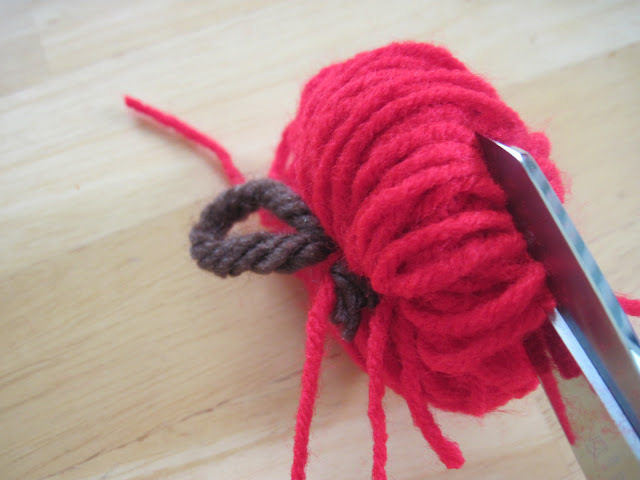 Lay a length brown yarn which will be your stem and bend in half on top of the knot you just tied. 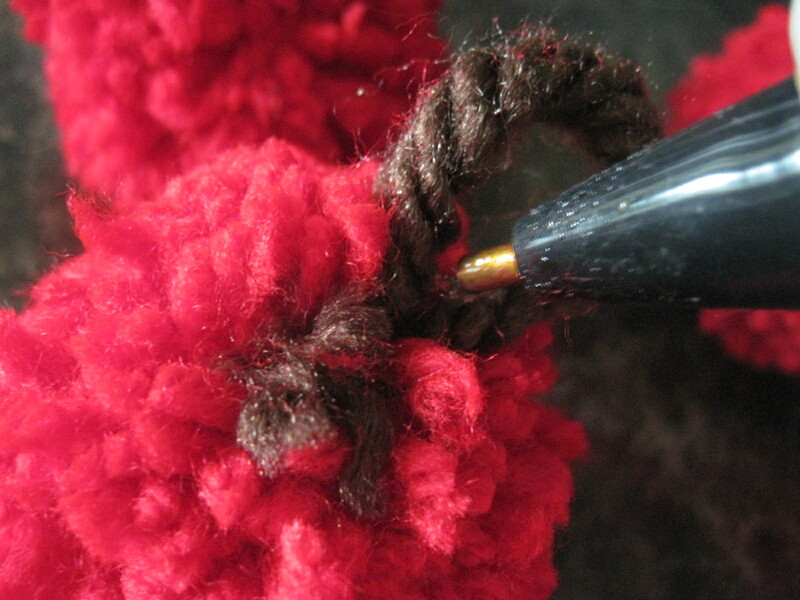 Using the same red string, tie another knot, securing the brown yarn. Snip the excess. 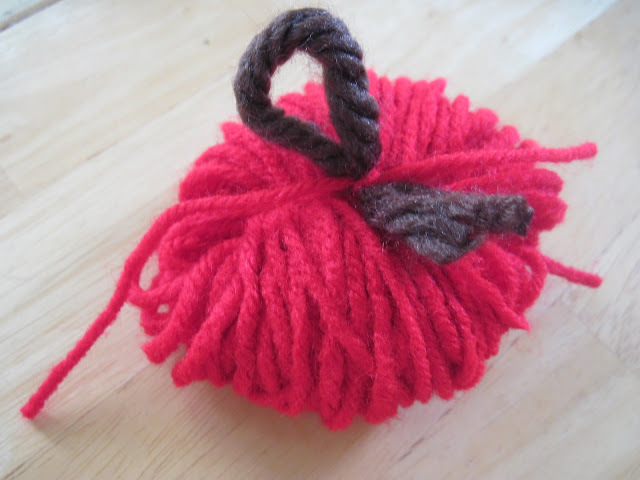 Another way to do this is instead of bending it in half with the loop at the top...tie it in the middle of the brown yarn with the two open ends sticking up. Then glue them together. Now cut along all the loops around the apple. 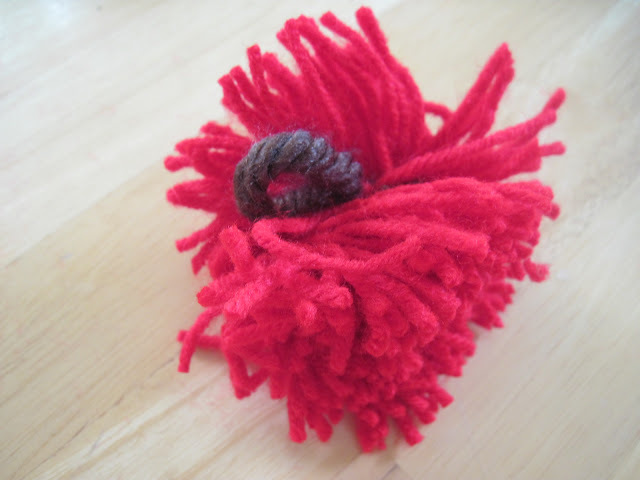 And you get this crazy looking pom pom that needs a haircut. Now it is time to play beauty parlor. Start asking about little apple's family, if he would like to upgrade to green highlights like the trendy granny smith's do...blah, blah. blah. 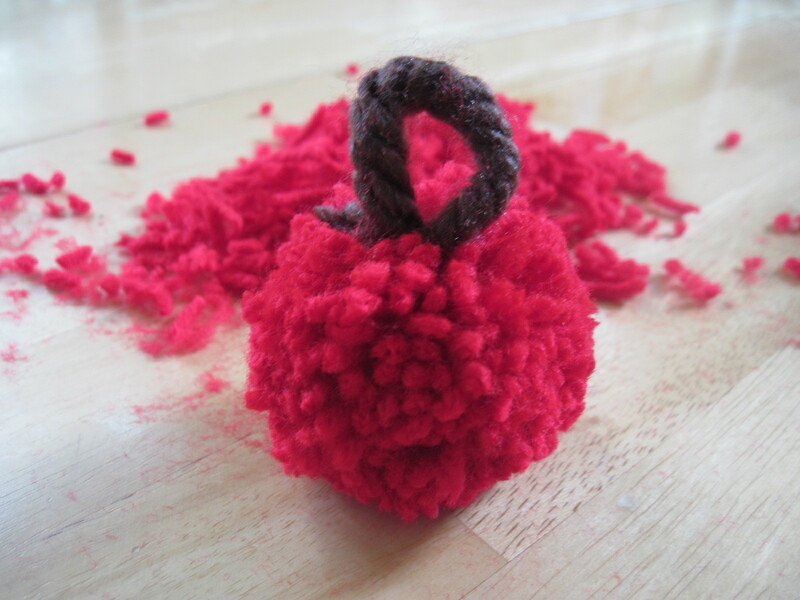 And there you have a cute little pom pom. I decided to glue my little loops together. I just dabbed a bit of hot glue to the inside of the loop and closed it together. 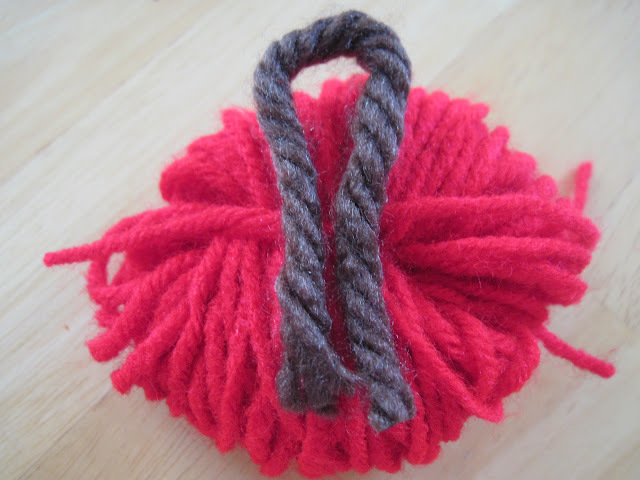 Do you see that extra brown yarn next to the loop? That is where you glue the leaf. 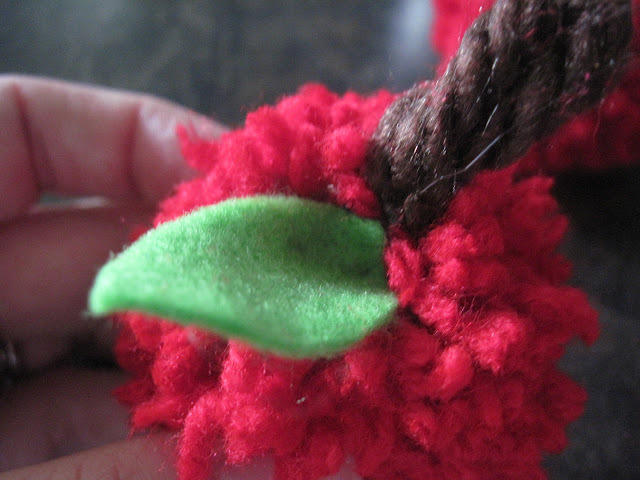 I cut out tiny, green leaves from felt and glued it on to hide the brown end of the yarn. Look at that cute little munchkin! Then I decided to make a garland to look like tree branches. I used twine and cut out green leaves from scrapbook paper. If I had more time, I would have used felt but I needed to triple up on the cutting! I wonder how it will look in the class room? I bet it would be fabulous outside, in the yard, or on a porch. 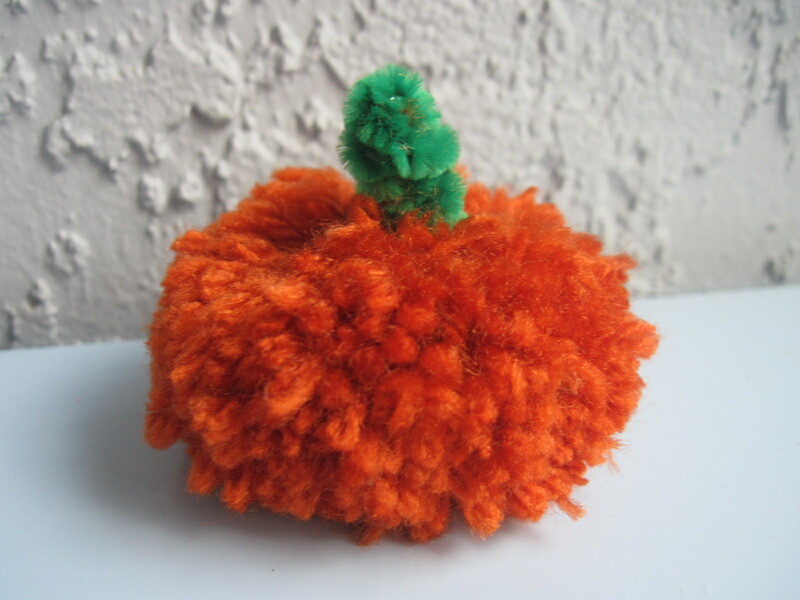 While I was at it, I made this pumpkin too. I have a little bit more stuff to show you...not much...but I will do that in another post along with the cupcakes I am about to go make. So part two to come...hope this inspires you for a little bit more Fall Fun! 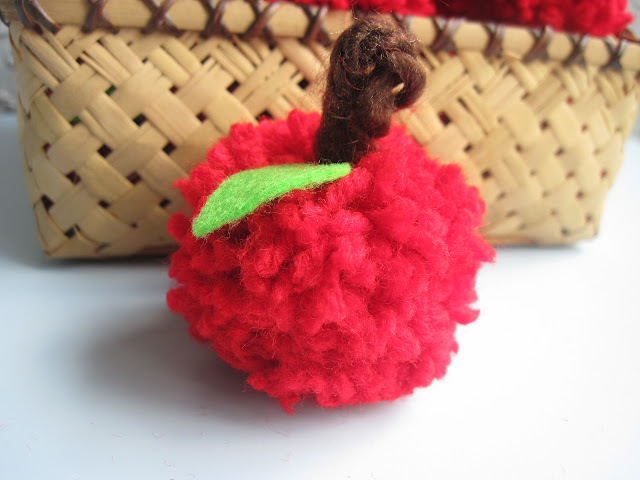 When I got to the cute little pom pom apple, I literally OUT LOUD said, "no she didn't". Ok seriously Jessica. I cannot wait to hear how the party goes and what everyone thought of the decorations. Please please take pictures! I am so thankful I get to see all this IRL! 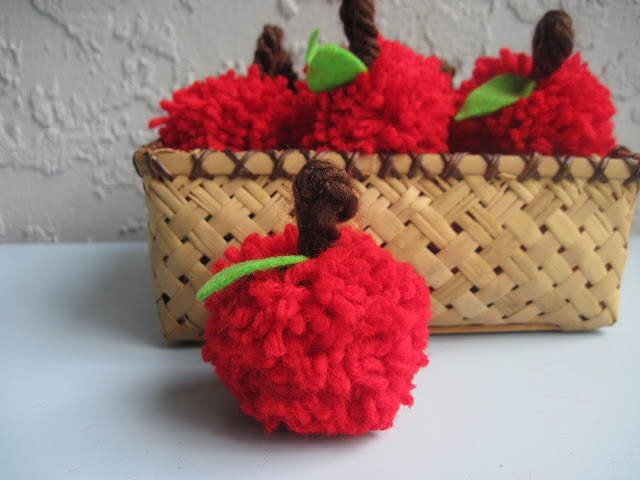 The pom pom apples are toooooo cute! Love it. There was never a more perfect match made than Jessica + Party Mom. I was already shaking my head in awe at the apple plates. You should have seen me when I got to your tutorials on the pom pom!! By the way, I laughed out loud over the little rabbit trail you started down with your "hair stylist dialogue" with the apple. Granny Smith is OH SO trendy right now! haha! oh my word, how do you have time for all this??? You really are gifted to be with children. I could never do it, I would cry all the way through party planning and the whole party! I love the apple pom poms, they are just tooooooooo cute! Jess, once again you shame me. They picked the perfect party room mommy when they picked you sister. I'll give you a room in my house. We can party every day! You make the goodies and I will give my undying gratitude for the great work! Ignore me, please. It's pure jealousy speaking. Looks so cute! Glad to see you posting more! You are always the first blog I check and most of the time the only one! Thanks! Very cute, you are very creative. Visiting from TT&J. those pom poms are soooo cute! Very creative! What a fun party theme and those pom poms are too cute! This is too cute! 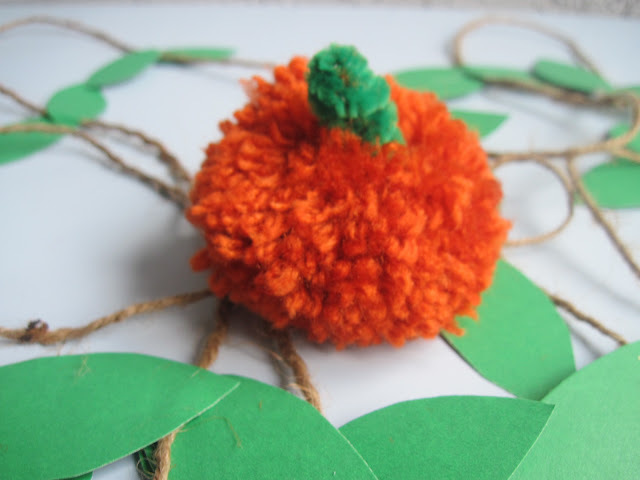 Love the little pumpkin - looks like you did a fabulous job!